For the first time, see from the library of one of America's foremost collectors of U.S. paper currency, some of the rarest bills ever engraved. 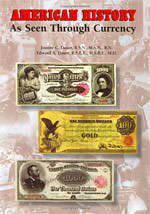 Learn about the historical events that occurred when these notes were printed, spanning the years 1861-1929. The currency notes are reproduced in full color from high-resolution digital files. Read the fascinating history behind many of these one-of-a-kind notes, some with a market value in excess of $1,000,000.